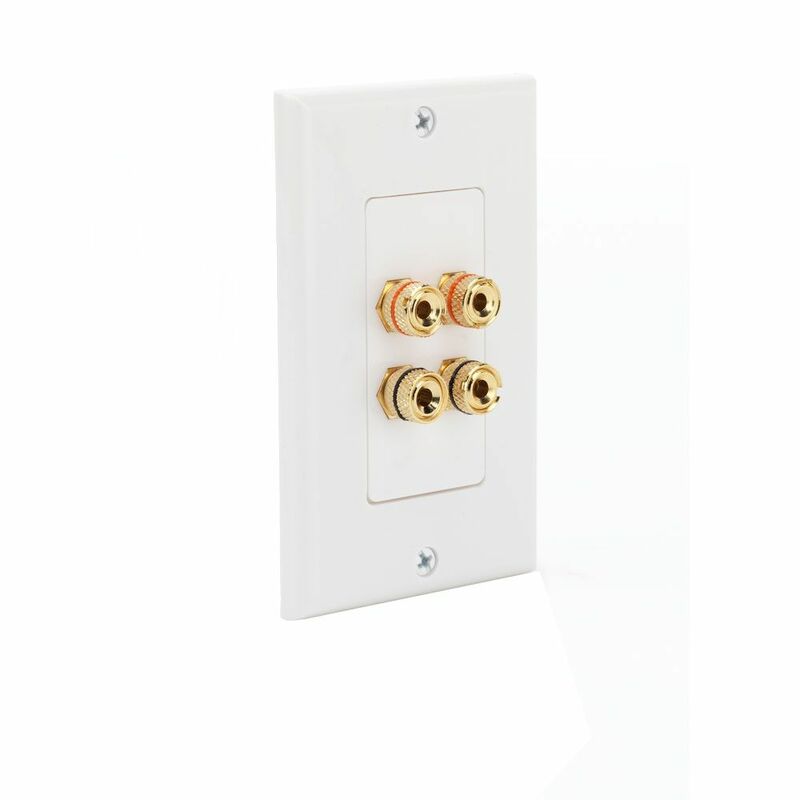 Use the CE-TECH Speaker Binding Post Wall Plate to connect in-wall speaker wire in your entertainment center. This wall plate is compatible with regular speaker wire and banana plugs. Speaker Wall Plate With 4 Binding Posts Use the CE-TECH Speaker Binding Post Wall Plate to connect in-wall speaker wire in your entertainment center. This wall plate is compatible with regular speaker wire and banana plugs. Speaker Wall Plate With 4 Binding Posts is rated 4.0 out of 5 by 3. Rated 4 out of 5 by deadshift from simple, sturdy, unimpressive Absolutely functional, does exactly what you expect. Screw down or banana plug from either side. Screw action feels gritty, which leaves you feeling like this isn't a top-tier product. That said, it does feel sturdy, and it's not likely to let go of what is inserted and screwed down. Flat head slots if you can't get your thumbs in those tight spaces. The orientation of the wire insert hole is random, so again, not impressing any of my audiophile friends if they look at it or fiddle with it. But as it is not meant to be seen or fiddled with often, I am satisfied that it will do its job and not need replacing... probably ever. Rated 3 out of 5 by Anonymous from Does the job but could have better design Banana post connectors are the best way to connect speakers to your stereo through the wall and these work fine. However, the wall plate is a 2-piece design with a perimeter mounting frame and an insert containing the banana posts. As such, the posts are close together, so its important to not have excess wiring that could accidentally short between the terminals. There are better design wallplates out there, including one-piece models that have a non-gloss finish for field painting to match your wall color, have hidden (instead of exposed) screws, and banana posts with better spacing between the posts for ease of wiring.